Que el hombre deve alegrarse en Dios. Juppiter, hasta el cielo afortunado. Aqueste dios aver sido tocado? En puro amor, de Dios esta ensalçada. 1. 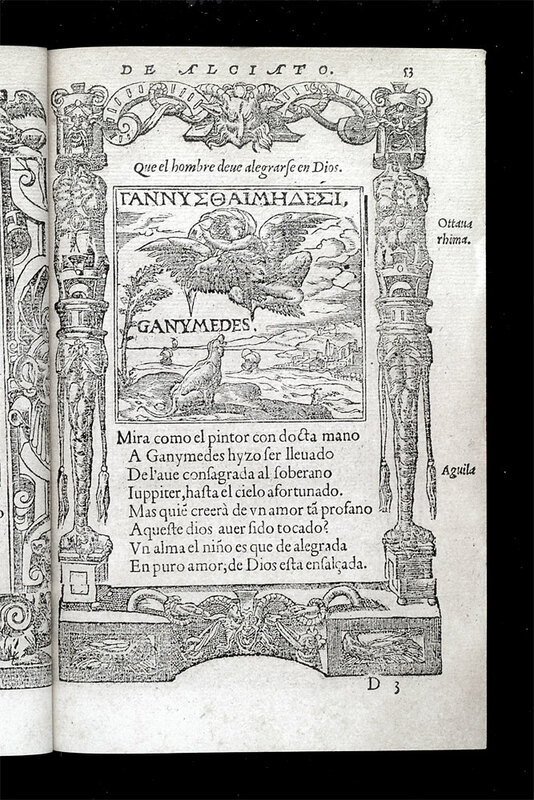 Ganymede, son of the Trojan prince, Tros, snatched away by the gods to be Jove’s cup-bearer. See Homer, Iliad 20.232ff, though the eagle is a post-Homeric addition. 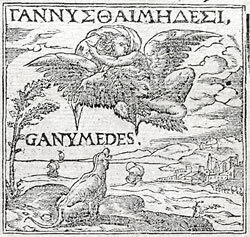 The Greek motto in the accompanying illustration means ‘to delight in counsels’, referring to a supposed etymology of the name Ganymedes, for which see Xenophon, Symposium 8.30.